Satin stripe duvet covers are supplied in different fabrics and thread counts. 50% polyester/50% cotton percale with a 206 thread count, Cotton rich 80% cotton/20% Polyester with a 200 thread count or luxury 100% mercerised cotton with a 300 thread count, The fresh look of the satin stripe duvet cover will enhance the décor of any bedroom. Satin stripe duvet covers are used widely in the hotel industry. Hotel satin stripe polyester/cotton duvet cover This polyester cotton percale self stripe design is simple but stylish. The fresh look of the satin stripe will enhance the décor of any bedroom. Manufactured in high quality 50/50 polyester-cotton percale. Bag Style, extra long to tuck under the mattress. 1cm satin stripe. 206 thread count (206 threads per square inch). White. Available in single size 140/230cm, double size 212/230cm, king size 236/250cm and super king size 278/250cm. 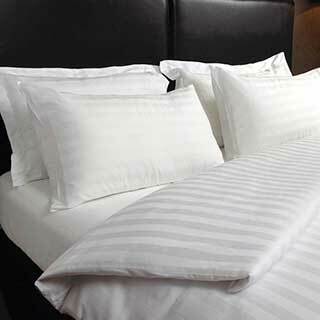 Hotel satin stripe polyester cotton percale duvet covers. This excellent quality polyester cotton percale easy care self stripe design is simple but stylish. The fresh look of the satin stripe will enhance the décor of any bedroom. Popper fastening. 1cm Satin stripe. 206 thread count (206 threads per square inch). White. Polyester cotton 1cm satin stripe duvet covers.This polyester cotton percale easy care self stripe design is simple but stylish. The fresh look of the satin stripe will enhance the décor of any bedroom. Manufactured in top quality 50/50 polyester cotton percale. Supplied with envelope end. Envelope end has 30cm (12") flap. 1cm satin stripe. 206 thread count (206 threads per square inch). White. 100% cotton 1cm satin stripe duvet cover set with envelope end, includes pillowcase(s) . This luxury 5 Star 250 thread count bed linen is made from the finest cotton yarns - 100% mercerised cotton. 1cm satin stripe design. Available in single, double, king size and super king size. All cotton goods will shrink approximately 6% on weft (width) and up to 8% on warp. Cotton rich 2.5cm satin stripe duvet cover in bag style. Manufactured from fine soft 70% cotton and 30% polyester, this is our standard bed linen used in the hotel and commercial market - 200 count (200 threads per inch). Available in pack of 5 only. Available in bag style duvet cover and matching pillowcases. Easy care cotton blend. Available in single size 165/240cm, Double size 220/240cm, King size 245/260cm and Super King size 280/260cm. Machine washable at 60°C. Also available in 1cm satin stripe. 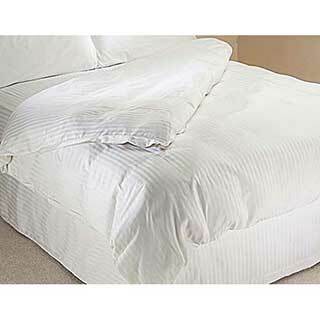 Hotel satin stripe popper fastening duvet cover in polyester cotton in ivory with 1cm satin stripe. This polyester cotton percale easy care self stripe design is simple but stylish. The fresh look of the satin stripe will enhance the décor of any bedroom. Manufactured in excellent quality 50/50 polyester-cotton percale. Popper fastening. 1cm satin stripe. 206 thread count (206 threads per square inch). Ivory. Matching pillow cases housewife style or mock oxford style available. Also available in White. Hotel satin stripe envelope end duvet cover in polyester cotton in ivory with 1cm satin stripe. This polyester cotton percale easy care self stripe design is simple but stylish. The fresh look of the satin stripe will enhance the décor of any bedroom. Manufactured in excellent quality 50/50 polyester-cotton percale. Supplied with envelope end. Envelope end has 30cm (12") flap. 1cm satin stripe. 206 thread count (206 threads per square inch). Ivory. Cotton rich 1cm satin stripe duvet cover in bag style. Manufactured from fine soft 70% cotton and 30% polyester, this is our standard bed linen used in the hotel and commercial market - 200 count (200 threads per inch). Available in pack of 5 only. Available in single size 165/240cm, Double size 220/240cm, King size 245/260cm and Super King size 280/260cm. Machine washable at 60°C. Also available in 2.5cm satin stripe.